August 20, 2017 - Today's adventure brought us to Garden Grove, CA to visit the Stanley Ranch Museum and Historical Village. The village is on a two acre plot and has 17 historic buildings, some of which are replicas and the others are original buildings. Many of the structures and relics date back to the 19th century. This is the one of the highlights of the village, the Ware-Stanley House, which was built in 1891. Because it was only owned by one family, almost all of the furnishings are original to the house. Agnes Stanley, the daughter of Edward and Mary Ware, lived here until 1971, when the house and grounds were donated to the Historical Society. All of the other buildings on the property were moved here from various locations within Garden Grove. The first post office opened in 1877 within a general store, but the postmaster had this building built, which subsequently opened in the 1880s. This is the Schnitger House, a California bungalow built in 1916. The schoolhouse was originally built as a temporary structure in 1921. The Disney Garage is likely the most famous structure on the property, particularly with Disney fans. The one car garage once sat behind the home of Walt Disney’s uncle and was the first workplace where Walt practiced animation starting back in 1923. It's the low blue structure in the picture. This was our tour guide, Carl. The Garden Grove Historical Society has done a wonderful job of preserving the past. 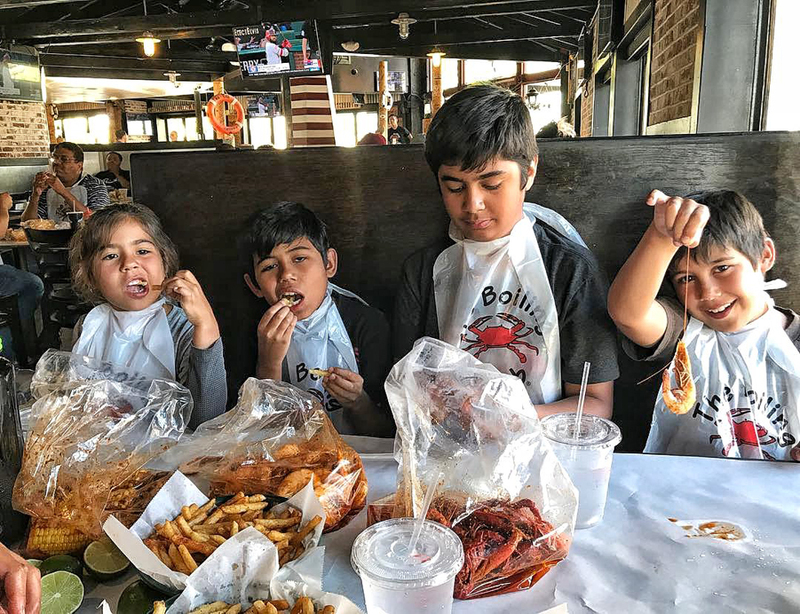 For lunch we chose the Boiling Crab Seafood Restaurant, also in Garden Grove. It was wild! Our server tore off a six foot long piece of paper that was our tablecloth. There were no utensils laid out for us and we didn't know what we were in for. Most of the seafood is either steamed or boiled and you get to choose what kind of sauce you want with it. Judy went for one of their fried selections, which was fried shrimp served with lemon-pepper French fries. I ordered steamed clams with their garlic sauce. When our food arrived, Judy's was in a basket, which makes sense, and my steamed clams were in a plastic bag smothered with their spicy garlic sauce. Everything was eaten with our hands and everything was delicious! I ended up ordering a bowl of rice (that came with a spoon) so I could pour the rest of my sauce over the rice. This place is a real treat, which we should have figured out from the line waiting to get in.